I didn’t even know what a Meyer Lemon was until I noticed them popping up on New York restaurant menus a few years ago. I guess they’re stylish. I try not to be seduced by trendy ingredients, but in this case I was curious. I like lemons. 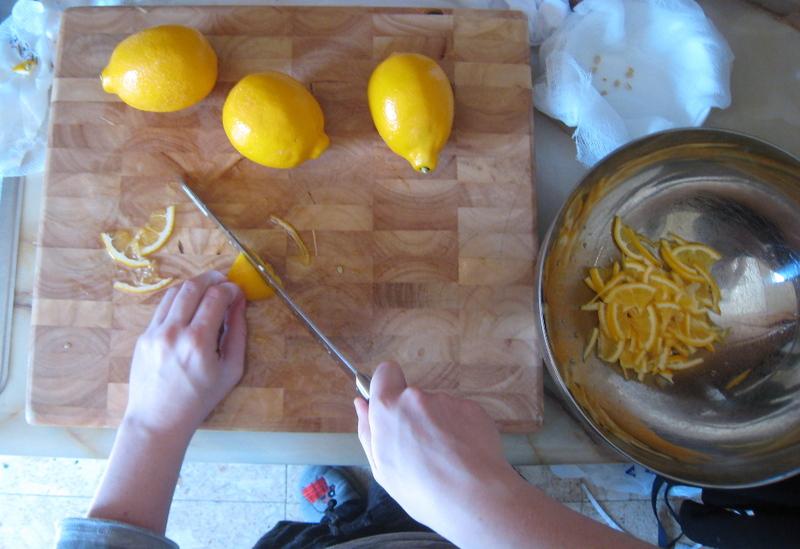 What was so special about these so-called “Meyer Lemons”? Turns out, it’s the taste. People describe it as floral, but it took many moments of concentrated savoring (and a conjured image of wildflower fields) before I detected the famed “floral” notes. I suppose it’s there. But I really noticed the lower acidity (less pucker power) and the hint of sweetness, reminiscent of a mandarin orange. That makes sense, since the Meyer Lemon is an orange-lemon hybrid. Native to China, samples were brought to the United States in 1908 by agricultural explorer Frank Meyer. But the thin-skinned fruit isn’t well suited for shipping, so it remained an obscure variety, planted in backyards and used as decoration. California chefs like Alice Waters discovered the unique sweet-lemon flavor of the Meyer Lemon in the 1980’s, and it began appearing on prestigious menus. Word got around, and now you can find Meyer Lemons (in season) at farmers’ markets and in some supermarkets (like Whole Foods). Peak season is November through January, but, for procrastinators like me, they can sometimes be found through April. Back in December, when I was helping with the launch of Gourmet.com, I decided this would be the year when I would make every Meyer Lemon recipe under the sun (or at least every recipe on Gourmet.com). Fast-forward a few months and Meyer Lemon season is almost over! I bought a few pounds Friday night and decided to make marmalade. I’ve never made preserves, and I’d be lying if I said it was easy. Fun? Yes. Rewarding? Yes. Easy? Not at all. “No,” was the standard answer. Finally, I went home and “Google” searched “places to buy Mason jars in New York City,” and I found them at the uptown gourmet market, Zabar’s. And as I was making my special jar-hunting journey (Zabar’s is a 2 hour round-trip subway ride from my apartment on a Saturday), Geoff sent me a text message detailing our dinner plans for the evening and warning me not to kill anyone with “botulism.” That brought my enthusiasm to a screeching halt. I didn’t know canning could be deadly! 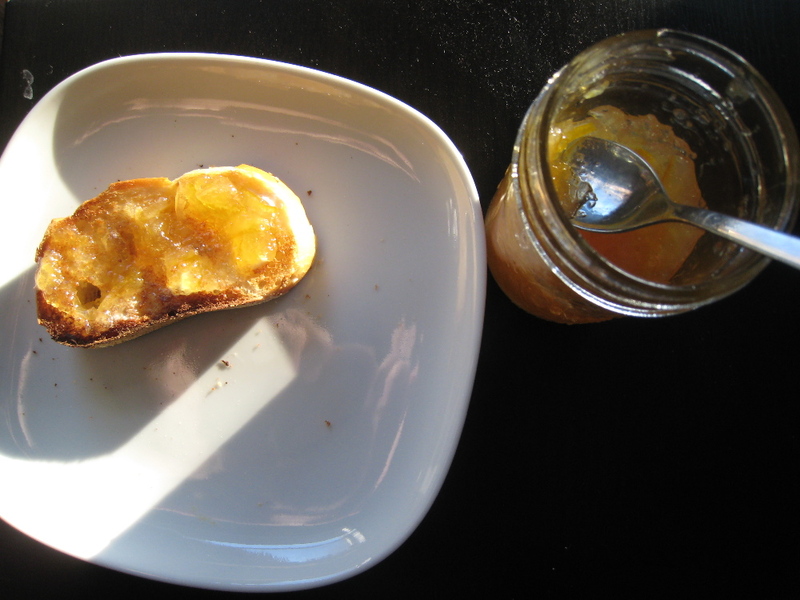 We spent a good part of that evening researching this super-serious bacterial nuisance, and came to the conclusion that making fruit preserves is relatively safe, since botulism is less likely to occur with more acidic foods. Thankfully, acidity is one thing lemons have in abundance. Still, just to be safe, I turned Geoff’s kitchen into a sterilized lab-like environment for the canning process. For more on canning safety, visit the National Center for Home Food Preservation. The marmalade-making process itself was fun! A little simmering, a little ladling, a lot of sterilizing, and now I’m the proud owner of four jars of Meyer Lemon Marmalade. I even promised to take one back to my Mom next time I go home. 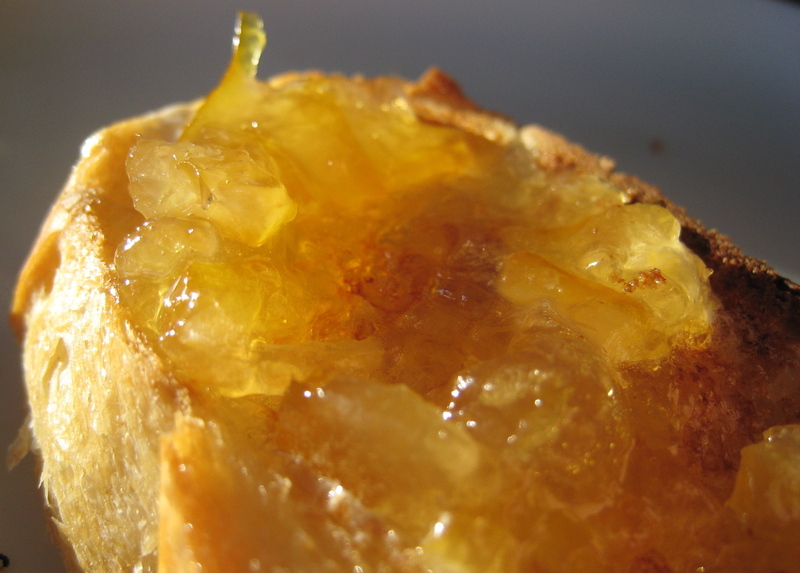 Best of all, it tastes vibrant, complex, different—it’s simply the best marmalade I’ve ever eaten. I might be hooked on this preserve-making thing! I’m already looking forward to rhubarb and strawberry season. And now I know where to find jars. Here’s a video of June Taylor making marmalade. Watch it for inspiration! Halve lemons crosswise and remove seeds. Tie seeds in a cheesecloth bag. Quarter each lemon half and thinly slice. Combine with bag of seeds and water in a 5-quart nonreactive heavy pot and let mixture stand, covered, at room temperature 24 hours. Bring lemon mixture to a boil over moderate heat. Reduce heat and simmer, uncovered, until reduced to 4 cups, about 45 minutes. Stir in sugar and boil over moderate heat, stirring occasionally and skimming off any foam, until a teaspoon of mixture dropped on a cold plate gels, about 15 minutes. Put jars in a water-bath canner or on a rack set in a deep pot. Add enough hot water to cover jars by 1 inch and bring to a boil. Boil jars, covered, 5 minutes and transfer with tongs to a rack. Cool jars completely. * Marmalade keeps, stored in a cool, dark place, up to 1 year. ** To Sterilize Jars, from Gourmet: Wash jars in hot suds and rinse in scalding water. Put jars in a water-bath canner or on a rack set in a deep pot and cover with hot water. Bring water to a boil and boil jars, covered, 15 minutes from time steam emerges from pot. Turn off heat and let jars stand in hot water. Just before filling them, invert jars onto a kitchen towel to dry. (Jars should be filled while still hot.) Sterilize lids in boiling water 5 minutes. *** But according to Alton Brown, boiling the lids could ruin the sealing mechanism. He suggests turning off the heat and letting the pot of jars cool for 5 to 10 minutes. Then he throws the lids in with them. This is what I did. Will you have the jar to her before October? Like lets say late August early September? I’ll bring the bagels!!! Yumm!! That sounds awesome! I’ll try it next time I make something with a tablespoon of tomato paste. I’m a sucker for good spreads! Fish’s Eddy on Broadway and 19th street has canning jars as well. Occasionally the Target in the Atlantic Center has short, squat 8 oz. mason jars that are the perfect size for gift giving. I am enjoying my jar immensely since bringing it back from New York. You outdid yourself on this one. Yeah! This is very good marmalade…and I don’t even like lemons that much.